Includes "Chorus Line," "Birdie" and "My Fair Lady"
Reagle Music Theatre of Greater Boston will feature a trio of Tony Award-winning musicals for its 44th consecutive summer season. 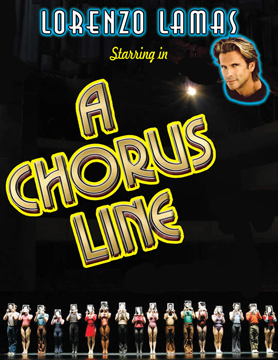 "A Chorus Line," the ground-breaking 1970s musical about unsung Broadway dancers putting everything on the line, opens the season June 15-24. Lorenzo Lamas will star as Zach. "Bye Bye Birdie," the jubilant 60s rock ‘n’ roll inspired parody of what happens when an Elvis-like star swings through a small town looking for one last kiss before entering the Army, runs July 13-22. The production will feature Anita Gillette as Mae Peterson. The season will be completed from August 10-19 with "My Fair Lady," the timeless 1950s Lerner & Loewe classic about an arrogant professor’s transformation of a Cockney flower girl into an elegant, proper-speaking lady. Rick Hilsabeck will star as Henry Higgins, with Reagle favorite Sarah Pfisterer as Eliza Doolittle. Casting for all three productions will be announced shortly. Robert Eagle, Founder and Producing Artistic Director of the long-running regional theater, commented, “In choosing the lineup for this season, we wanted to offer something for everyone. 'A Chorus' Line speaks to the hopes and aspirations of not just dancers but of anyone willing to risk hardship in pursuit of a dream. Its themes are as relevant today as they were when it first took Broadway by storm in 1975. 'Bye Bye Birdie' is a fun throwback to more innocent times when telephones were hard-wired and conversations were not limited to 140-character texts. Despite what some might consider quaint charms, however, 'Birdie' was a little bit ahead of its time. Opening in 1960 on the cusp of the Civil Rights movement and sweeping social change, it dealt humorously but pointedly with the widening generation gap and issues of the day. It’s an interesting show to revisit in the age of digital media and rampant celebrity worship. In recognition of the region’s continuing economic challenges, Reagle has rolled back single-ticket prices for the entire 2012 summer season. In addition, significantly discounted Early Bird summer subscription packages are being offered. Patrons purchasing a three-show subscription now through May 18 will save 40% off the single ticket price. Patrons purchasing a three-show subscription May 19 - June 24 will save 25% off the single ticket price. Seniors 60 and older will now save $3 on any full-priced ticket throughout the 2012 summer season. Youth tickets for students aged 5 - 18 are now just $20 for any seat at any show in the 2012 summer season. Reagle Music Theatre is a unique award-winning professional regional theater company that features Broadway stars performing alongside local talent. Founded in 1969 and operating year-round, Reagle produces major summer musicals, spectacular seasonal revues, and celebrity concerts featuring legendary entertainers. The company also offers a variety of school-based educational programs and musical theater camps designed to give children in the West Suburban region the opportunity to expand their horizons through the performing arts. Stars who have appeared at Reagle include Brent Barrett, Patrick Cassidy, John Davidson, Mitzi Gaynor, Robert Goulet, Shirley Jones, Patti LuPone, Ann Margaret, Andrea McArdle, Lee Meriwether, The Mills Brothers, Sarah Pfisterer, Debbie Reynolds, Sally Struthers, Tommy Tune, Leslie Uggams, Joanne Worley, and Rachel York. For tickets and information, stop by the box office at 617 Lexington Street in Waltham, call 781-891-5600 or visit www.reaglemusictheatre.org.